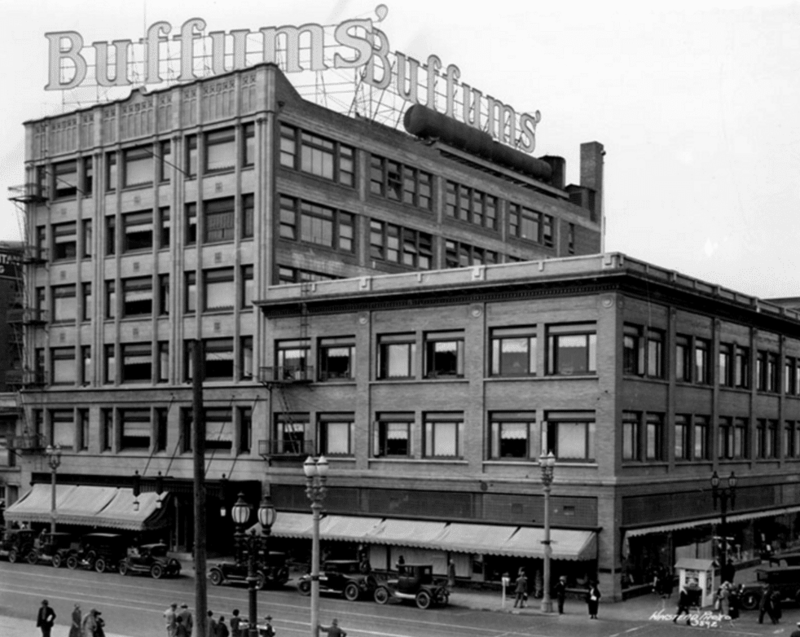 Once standing tall at the southwest corner of Broadway and Pine in Downtown, this particular Buffums’ store was one of its most important because it launched the empire of westward-bound brothers Charles and Edwin Buffum. Originally the Schilling Bros. Mercantile Store at 100 W. Broadway (now home to the WeWork Building) the pair of Illinois siblings purchased it in 1904, transitioning it from a dry goods store. After that, Buffums’ boomed into an 87-year-long empire. In just under two decades, a six-story addition to the south of the original building was built in 1925. The street level held everything from its jewelry to handbags to the launch of its men’s store. The second floor catered to children’s clothes while the third floor featured designer clothing and lingerie. The fourth floor was bed and bath, the fifth floor filled with its offices, and the sixth floor held the terrace to the Four Seasons Restaurant. Come 1941, they built an autoport that is now a historic landmark off of First and Pine, saving it from destruction. However, the building itself was not designated as such and was demolished in 1985 to make way for the office building and restaurant space currently there, home to WeWork and the Downtown Long Beach Alliance. In the 1970s, Australia-based investor David Jones Ltd. bought the Buffums’ empire and just a decade later, was searching to sell the struggling chain as hard times hit. By the time of the sale, Buffums’ had become part of Adelaide Steamship, an Australian conglomerate, which never found a buyer. In a last-ditch effort to modernize and keep up with more successful stores like Macy’s and JCPenney, Buffums’ installed new point-of-sale registers in all stores in 1990, only to enter liquidation following the 1990 Christmas shopping season, according to the Los Angeles Times. By March of 1991, there were signs posted at all 16 Southern California locations: “All Sales Final. No Returns. No Exchanges.” At the time of the closing, there were losses of $4.2 million on sales estimated at $110 million in its last fiscal year. Buffums’ lineage didn’t stop at the store: Edwin is the father of the late Dorothy Buffum Chandler, who helped establish her famous namesake, the Dorothy Chandler Pavilion and Music Center that was home to the Academy Awards for years, in Downtown Los Angeles.